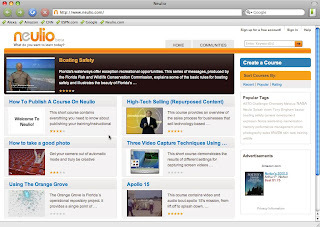 Neulio's new educational video platform makes it possible for individuals to easily create educational and training videos that follow sound instructional design and have a measure of quality assurance, which is, as we all know, quite rare in the wild-west, anything-goes world of user-generated content (UGC) and Web 2.0. Anyone who has ever tried to create their own video-based course by using existing hosting services or by hosting it yourself is familiar with some of the obstacles. Google video and YouTube make it very easy to upload and share videos, and even restrict access to certain users, and, they make it possible to embed a video in your course website or download videos to your mobile devices. Sounds good? It is, to a degree. It's a great way to make your videos accessible across platforms, but the problem is that the platform itself is not pedagogically friendly. You have to do a lot of work. Further, you're never really sure if your students are experiencing the video content in the way you'd like them to. You can try to make sure that they see the videos in a certain sequence, but it is very difficult to link them. Neulio (http://www.neulio.com/) - a new educational video platform, hosting service, and instructional template framework – could provide a solution. Neulio is as easy to use as YouTube or Google video. The user can upload a video directly from his or her camera or phone. In the case of Neulio, user generated content -- all of it -- is free to view and free to post. What is different about Neulio is that it is designed specifically for online training and learning via user-generated video content. It's a simple solution that allows individuals to create useable video training without having to have an extensive IT department or a team of instructional designers. Neulio does for training, learning, and how-to content what YouTube did for simple video content. The coursebuilder tool is engaging, and its ease of use encourages the individual to create content and to use it in innovative ways. Changes are simple and do not require the involvement of IT teams, instructional designers, instructional technologists. In addition to time savings, cost savings can be significant. It is not uncommon for individuals to have content in different formats. Neulio accommodates different types of video content, and further, it converts it to a flash format that is compatible with many other types of players (mobile devices, phones, laptops). Gates are user-configurable controls that allow the user to regulate a course consumer's movement between lessons. Types of gates include passwords and quizzes. 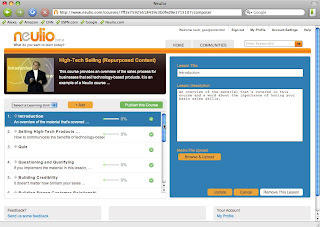 Neulio allows the course developer to create quizzes that are used by the student in the way they were intended, and at the point and in the sequence. This helps assure that learning is taking place. However, one would be remiss if one did not mention that there are potential downsides. Like many new programs (especially those that emerged during the dot.com times), the service must achieve critical mass. That means that many users need to use it, and the UGC must be of sufficient quality and relevance to excite other uses. Further, it will be necessary to find productive partnerships in order to assure large user groups and to test out the bugs. Needless to say, this requires the architecture to be massively scalable. That is not always the case. Finally, one must avoid the pitfalls of getting a partner that is too large too soon. How many potentially useful products are still languishing in Google’s sandbox / beta-testing area and have never actually seen the light of day? Those provisos notwithstanding, Neulio represents a breakthrough for e-learning. It allows user-generated instructional content to be used in a meaningful way. Further, it allows the user-generated content to be much higher quality than one would ordinarily expect. Neulio functions as a virtual instructional design team and it gives the guidance that users need to create video content that is pedagogically effective. The Neulio concept is potentially revolutionary. In addition to being used in online courses, the "how-to" element can span many uses. Theoretically, it could be used in conjunction with textbooks and e-commerce as well.